Cherry-picking in TortoiseGit is invoked from the Revision Log Dialog. 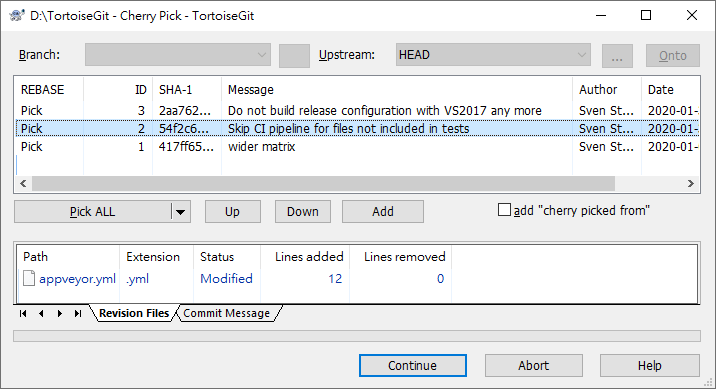 Within this dialog, select the commit(s) to cherry-pick, then right-click on one of the selected commits to pop up the context menu. Select Cherry Pick this commit... (or Cherry Pick select commits... if more than one commit is selected). The Cherry Pick dialog will be shown. The Cherry Pick dialog is similar to the Rebase dialog. The top table displays one line for each selected commit to cherry-pick. Buttons below it control the actions (Pick, Squash, Edit, Skip) and the order in which multiple commits are picked. Selecting a line shows the files affected by the commit. Although major merge work is done by git automatically while cherry-picking, a conflict may happen during cherry-picking (i.e., a file was modified in your current branch and also in one or more commits you are cherry-picking), please see the section called “Resolving Conflicts” on how to resolve conflicts. Please note, that "REMOTE"/"theirs" in the conflict editor refers to the changes your are picking and "LOCAL"/"mine" to your HEAD version in your working tree. You can find more information at the section called “git-cherry-pick(1)”.